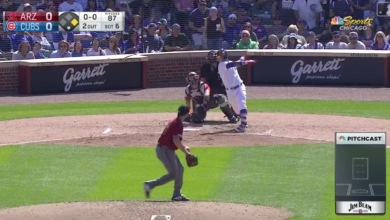 Javy Baez walloped his career-high 24th home run Sunday afternoon to get the Cubs on the board, which would have been interesting enough in and of itself. But what happened between the crack of the bat and Javy going into his trot made it all even cooler. His notoriously big swing carried his bat into the mitt of catcher Austin Hedges, so Javy remained at the plate to offer his apologies rather than pimp the homer and head around the bases. He knew it was gone as soon as he hit it, but may not have even seen it land as he checked on his opponent. I suppose it’s also possible El Mago was telling Hedges to stop diving forward to receive pitches, but that advice went for naught. The very next batter, David Bote, was called out when his backswing clipped the back of Hedges’ helmet as he blocked a ball in the dirt, preventing him from advancing on a dropped third strike.